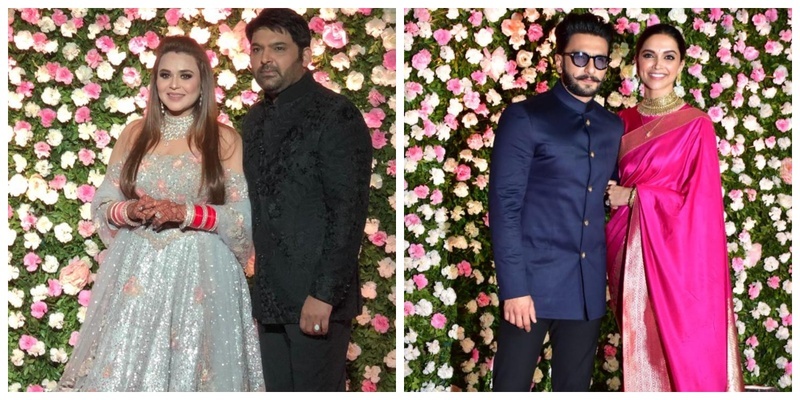 All the inside Deets, Pics and Videos from Kapil Sharma and Ginni Chatrath's Mumbai Reception! Kapil Sharma tied the knot to his longtime girlfriend Ginni Chatrath and their wedding of course mad a lot of noise. Last night the couple hosted a reception in Mumbai for their bollywood and TV industry friends and it sure was a night to remember. The night saw a lot of celebs attendance - from Deepika Padukone, Ranveer Singh, Anil Kapoor, Boney Kapoor, Karan Johar, Kriti Sanon, Rekha, Kartik Aaryan to Vicky Kaushal, among many others. Can't really stop admiring the bride who wore this silver embellished lehenga for her D-day, while Kapil looked dapper in the bandhgala! Deepika Padukone dazzled in a pink saree, while Ranveer complemented her in a navy blue bandhgala. She never disappoints with her fashion game on point does she? The duo looked dapper in black. Love this beauty in Monisha Jaising attire! She sure was a vision in white. She def seems to be channeling her inner princess vibes in this ruffled gown. KJO’s blazer game is def stronger than Kartik’s! She looks all dolled up this ivory lehenga skirt paired with the embellished choli. Yep, he ain’t aging a day! I literally can't take my eyes off her saree. Love how they have coordinated their outfits! That floral Nehru jacket is a total stunner! The man looks good in just anything! Love the golden detailing on her all-white attire! How does she always look so pretty! Well, a little more efforts would have been appreciated. (L-R) Shakti, Mukti, Kriti and Neeti Mohan looked their festive best! Okay, this lehenga is a total winner! Lobe the refreshing icy-blue colour here!